Maximizing Income is the flip side to the previous step, minimizing spending. The wonderful thing about maximizing income is that there’s a limit to how much you can save, but no limit to how much you can earn. This step isn’t only about your bottom line, it’s also about respecting yourself and your limited time on this earth. Ask yourself: Am I “making a living” or “making a dying?” What are your purposes for paid employment? Plenty 0f fast moneymaking schemes are out there, and unfortunately most of them are peddled by unsavory characters. One person whose advice I trust is Ramit Sethi of I Will Teach You To Be Rich. If you can get past his gen-x writing style, his blog and book have plenty of honest tips on earning some side income. Honestly, he devotes more of his time to getting his readers motivated than anything else. I took his advice and started moonlighting as a social media consultant. It didn’t really turn out to be something I wanted to devote serious time to, but it was rewarding to teach others and earn a little money on the side. 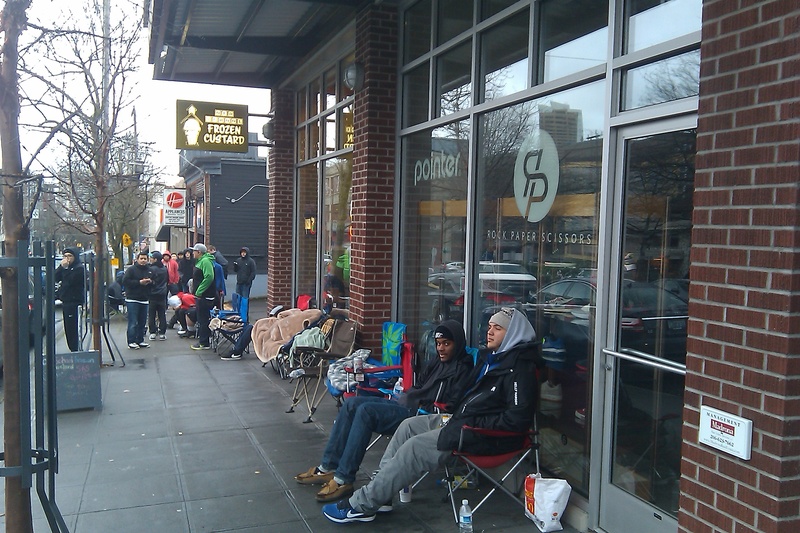 On the way to work today, I walked pass this line of people waiting for a shoe store to open so they could buy the new Air Jordan shoes. The folks at the head of the line had been there overnight. I remember when I was about 12, a new version of Air Jordans came out. I begged and pleaded with my mom to buy me a pair. She finally gave in and bought them while I was at school one day. I came home and tried them on. I looked at myself in the mirror and realized I looked ridiculous, and had her return them the next day. I bet I never even apologized for making her go out of her way to the shoe store twice. I’m sure there’s a moral somewhere in this blog post. I’ll leave it as an exercise for the reader. 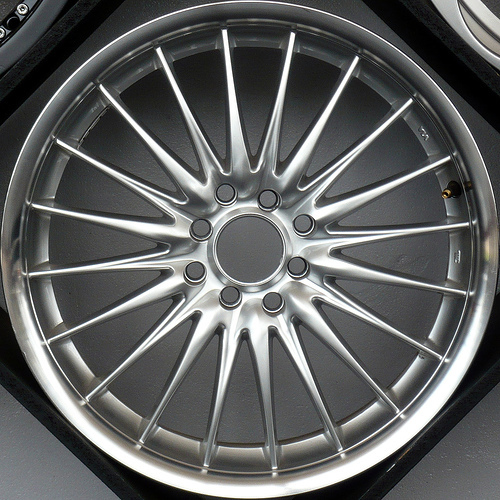 One day while I was driving through my ‘hood I saw a car with really sweet rims and I thought to myself: if the person driving that car needed to “tighten the belt” financially speaking, would he think to trade in the $10k rims for a more modest pair? That got me wondering, What are the “Sweet Rims” in my life? What are the objects, habits, lifestyles, etc., that I spend an inordinate amount of money on, but aren’t really an integral part of my happiness and values? I’m convinced that almost everyone has Sweet Rims somewhere in their life. Some are easy to spot: the daily latte ($5 a day = a Sweet Rim worth of money each year) or pack of smokes, or the couple of drinks at a bar every night. Some are harder to spot. For a time, my Sweet Rims was sporting goods, especially winter sports. But I realized that with the winter season only so long, it’s not even fun trying to keep up with snowboarding and skiing. So I ditched all the snowboard gear* and now I focus just on skiing (biathlon, really). So what are your Sweet Rims? The default answer is “I don’t have any”…of course the person in that car wouldn’t think of his rims as something worth trading away in order to meet life’s goals. I challenge you to think long and hard about this. It might be a few small things. If you really can’t think of anything, then I applaud your lifestyle and frugality, and aspire to be more like you! * Carl Richards relates a similar story in his book The Behavior Gap , where he had so many pairs of skis he couldn’t decide which ones to use. It’s an awesome book which I highly recommend. 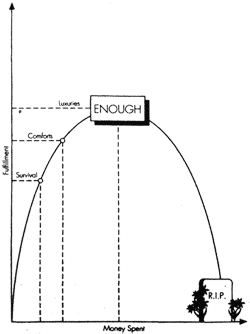 When “Your Money or Your Life” was written, the idea that this chart represents (“there’s an optimal level of consumption”) was pretty revolutionary. Since then, it’s become more mainstream: now we have the Voluntary Simplicity movement, and TV shows about people with small houses. The pendulum has swung away from “bigger is better” in the court of public opinion. 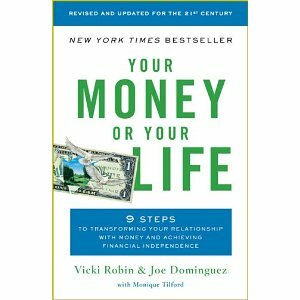 Summarizing this chapter is difficult, because you can’t just whip out a pen and paper and tabulate some charts about your money. There’s no formula or steps to follow, because “enough” is going to be different for each person. It rarely seems worth it to spend another hour in a cubicle to have a more tender piece of meat for dinner. Living a life of “enough” is what 90% of frugal blogs focus on: cutting back, doing without, “money-saving tips!” etc. It’s the stuff that practically writes itself because it’s so easy to look around your house and say “I wasted money (or time) on that.” But as we’ll see in the next chapter, there’s a flip-side to minimizing spending. Even better, it’s more enjoyable and potentially much more productive: maximizing income. Stay tuned!